Capital of a district of the same name, situated in the southwest of Moldavia, a division of Rumania, with a population of 15,000, one-half of whom are Jews. A census taken in 1876 enumerated 743 Jewish families at that time. The district contains 150,000 inhabitants, of whom, according to the official census of 1899, 15,667 are Jews. The community of Bacau is one of the oldest in Moldavia; its cemetery contains inscriptions dating from the beginning of the eighteenth century; there are no traces of any older burial-ground. It worshiped in a wooden synagogue which was destroyed by fire in 1853, and had been popularly supposed to be several centuries old. The present community possesses one synagogue, built in 1853, and twenty meeting-houses, mostly in rented buildings. Two of the latter, however, possess small libraries and are called "bet ha-midrash"; these buildings belong to the community, one having been erected in 1838 and the other in 1848. As in all important communities in Moldavia, Bacau has a "vekil ḥakam-basha"; the last representative of the "ḥakam-basha" of Jassy was Lupu Baruch. The administration of the community was in the hands of a committee of five, or seven, elected by delegates from the synagogues. Its institutions were supported by the revenues derived from the Gabella, which served in lieu of all imposts payable by the Jews to the state; later, however, an additional amount was imposed to pay for substitutes in the army. From 1864 the tax was intermittent; from 5 bani (1 cent U. S.), paid for each oca (kilo) of meat and for every head of poultry at the commencement of the nineteenth century, the tax rose to 25 bani (5 cents U. S.). Since 1850, the tax has furnished a revenue of from 48,000 to 68,000 francs yearly. Among the rabbis that have officiated at Bacau are Isaac Botoschaner (1803-58), a man of strong character, a distinguished Talmudist, and an opponent of Ḥasidism. A vault has been erected over his grave where a lamp is kept burning day and night, and the pious pray as at the tomb of a saint. His successor, Alter Ioines (1858-73), was likewise a distinguished Talmudist, much beloved and of great influence. The old Jewish society is the "Ḥebrah Ḳaddishah" (burial society), which also cares for the sick; it was founded in 1871 and lasted until 1885, when the cemetery passed under the administration of the Communal Committee. 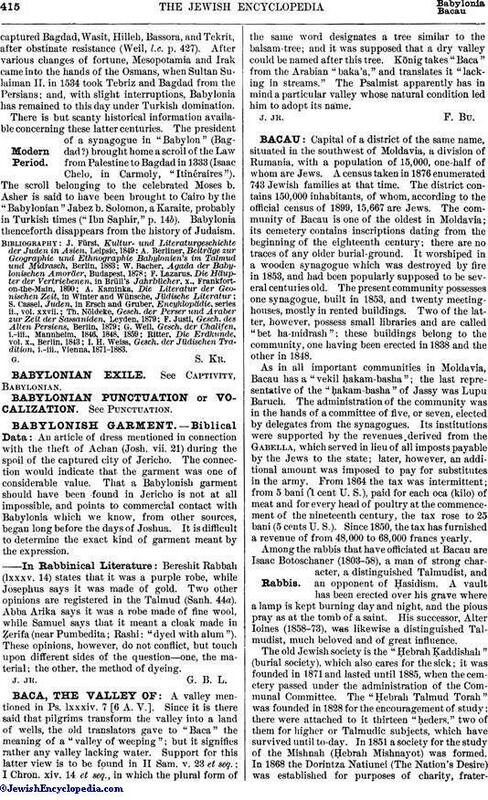 The "Ḥebrah Talmud Torah" was founded in 1828 for the encouragement of study; there were attached to it thirteen "ḥeders," two of them for higher or Talmudic subjects, which have survived until to-day. 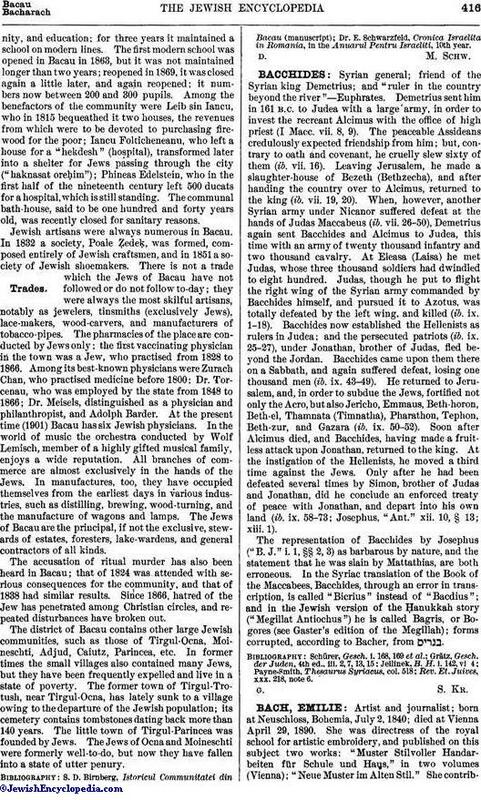 In 1851 a society for the study of the Mishnah (Ḥebrah Mishnayot) was formed. In 1868 the Dorintza Natiunei (The Nation's Desire) was established for purposes of charity, fraternity,and education; for three years it maintained a school on modern lines. The first modern school was opened in Bacau in 1863, but it was not maintained longer than two years; reopened in 1869, it was closed again a little later, and again reopened; it numbers now between 200 and 300 pupils. Among the benefactors of the community were Leib sin Iancu, who in 1815 bequeathed it two houses, the revenues from which were to be devoted to purchasing firewood for the poor; Iancu Folticheneanu, who left a house for a "hekdesh" (hospital), transformed later into a shelter for Jews passing through the city ("haknasat oreḥim"); Phineas Edelstein, who in the first half of the nineteenth century left 500 ducats for a hospital, which is still standing. The communal bath-house, said to be one hundred and forty years old, was recently closed for sanitary reasons. Jewish artisans were always numerous in Bacau. In 1832 a society, Poale Ẓedeḳ, was formed, composed entirely of Jewish craftsmen, and in 1851 a society of Jewish shoemakers. There is not a trade which the Jews of Bacau have not followed or do not follow to-day; they were always the most skilful artisans, notably as jewelers, tinsmiths (exclusively Jews), lace-makers, wood-carvers, and manufacturers of tobacco-pipes. The pharmacies of the place are conducted by Jews only; the first vaccinating physician in the town was a Jew, who practised from 1828 to 1866. Among its best-known physicians were Zurach Chan, who practised medicine before 1800; Dr. Torcenau, who was employed by the state from 1848 to 1866; Dr. Meisels, distinguished as a physician and philanthropist, and Adolph Barder. At the present time (1901) Bacau has six Jewish physicians. In the world of music the orchestra conducted by Wolf Lemisch, member of a highly gifted musical family, enjoys a wide reputation. All branches of commerce are almost exclusively in the hands of the Jews. In manufactures, too, they have occupied themselves from the earliest days in various industries, such as distilling, brewing, wood-turning, and the manufacture of wagons and lamps. The Jews of Bacau are the principal, if not the exclusive, stewards of estates, foresters, lake-wardens, and general contractors of all kinds. The accusation of ritual murder has also been heard in Bacau; that of 1824 was attended with serious consequences for the community, and that of 1838 had similar results. Since 1866, hatred of the Jew has penetrated among Christian circles, and repeated disturbances have broken out. The district of Bacau contains other large Jewish communities, such as those of Tirgul-Ocna, Moineschti, Adjud, Caiutz, Parincea, etc. In former times the small villages also contained many Jews, but they have been frequently expelled and live in a state of poverty. The former town of Tirgul-Trotush, near Tirgul-Ocna, has lately sunk to a village owing to the departure of the Jewish population; its cemetery contains tombstones dating back more than 140 years. The little town of Tirgul-Parincea was founded by Jews. The Jews of Ocna and Moineschti were formerly well-to-do, but now they have fallen into a state of utter penury. Dr. E. Schwarzfeld, Cronica Israelita in Romania, in the Anuarul Pentru Israeliti, 10th year.